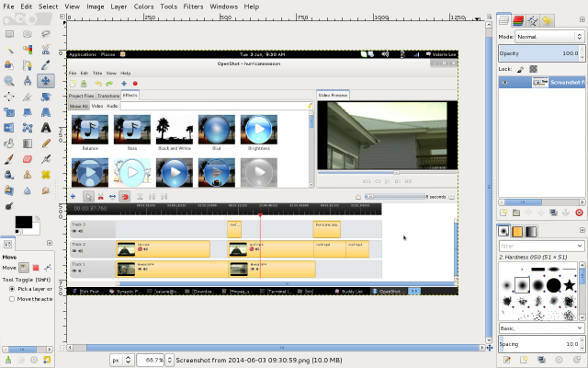 A screen capture of the free OpenShot video editor, being edited in the free GIMP image editor on Debian “Wheeezy”. Bill Gates is busy saving people in Africa with vaccines but the company he founded is creating a new technological poor over here in the West. Every free application Microsoft has bought has become closed off from independent developers who drove add-on programs to support/enhance user experience with such as the on-line telephony/conferencing software, Skype. Your applications, such as a Skype video recorder for example, may be left out in the cold unable to work with whatever Microsoft dishes up as Skype in a few months. And it will be that more difficult for in-house developers to create the app for your use case. Microsoft now claims that closing access to Application Programming Interfaces is because they want a unified system across all platforms (mobile and desktop). So why not allow the same access that developers are used to? Really Microsoft means it wants everyone captive in its ecosystem–much as Apple/Mac has done–and even more hostages with the new Software as Service (SAS) and cloud computing environment. They will live forever in our pockets with monthly fees and we may find ourselves unable to access our own data when a monthly bill is unpaid. It’s a big risk to move to open source and free software, but we’ve made the move at Abeng News. We’ve always used and supported freely available and freely accessible software such as WordPress, which is the engine that powers our site. WordPress is built with the open source PHP programming language, it is freely available for use by anyone who has access to a Web server and its source code is open so that anyone with the technical skills can amended it to suit their need and can give away their changed application or sell it for money. WordPress is also available as SAS, that is, once installed, it can be automatically updated from the developer’s code base without users, such as Abeng News, having to apply changes. In the back office, we’ve also been using more open source software such as Debian’s version of the Linux operating system, and free video and audio editors such as OpenShot Video Editor and Audacity audio editor. These are available from servers managed by the Debian community so that updates and upgrades can be done with the click of a button. It’s unfortunate that the Linux and open source community isn’t growing as it ought because many of the systems they introduced have been capitalized on by the closed source and commercial software giants, who, while making life simpler for their end users, are also helping to make them dumber technologically and therefore even more dependent on a software Big Brother. Everyone doesn’t need to be an automotive engineer to drive a car but knowledge of the combustion engine or fuel cell technology can help us as end users to make better decisions in purchases and in operating habits. Not so in the new era of a the monopolistic entrepreneurial technocracy, where “intelligent” machines are more valuable than and are replacing humans across all job categories. But that’s the nature of businesses that see humans as merely instruments in the scheme of production, and as potential consumers–even on less than minimum wage.